Are you writing a poem, a short story, a play, a novel, a screenplay …? Are you under 16, over 16, or even 16 exactly? I became a published author by winning a competition. It was the Times/Chicken House Children’s Fiction Competition, and you can find out more about it here, including Barry Cunningham’s writing tips. He discovered JK Rowling, so he knows a thing or two … The competition is closed for this year, but if you’re still polishing your children’s manuscript, keep an eye on when it reopens later in the year for 2017. If you can’t wait, ITV’s Lorraine has just launched a nation-wide hunt for the next bestselling author for 5-7s. You’ll need to send in the first 1000 words of your masterpiece by Monday, 29th February – so not long now – and may appear on TV. “The Betjamen Poetry Prize – it’s for poets aged 10 – 13 and the deadline for submissions is 31 July 2016, so you’ve got plenty of time. But there’s lots on the website to get your poetic juices going, courtesy of Indigo Williams, so have a look. The BBC Writers Room is of course full of opportunities for plays, film scripts and comedy. The Sky Blue Theatre Company even have a video about their British Theatre Challenge! And finally, Creative Writing Ink has a wonderful list of competitions for everything from poetry to playwriting to fiction to sitcoms. Whatever it is you’re working on, there is probably a competition you could enter it for, where you might be lucky and get shortlisted and get some invaluable feedback. Don’t be disheartened if you don’t get far this time. Having the courage to polish your work and enter is what matters. You might at the very least make friends with fellow entrants (I did). And you’re bound to learn a lot from the process – even just imagining what the judges might be thinking, and making your work as great as it can be to impress them. This seems to be giveaway week for my books, and that’s fine by me! 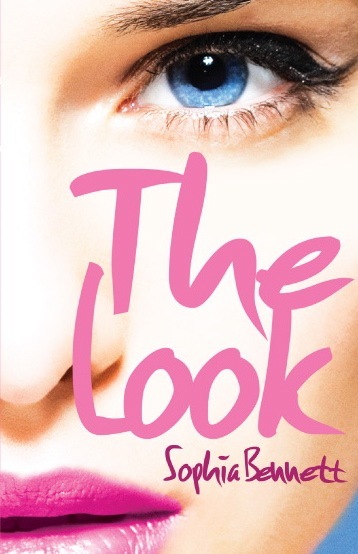 For readers in the US, there are giveaways of The Look running on Good Books and Good Wine and Rather Be Reading. Both these US bloggers have been so kind and supportive since they read the book, and I’m really grateful to them. It’s like someone welcoming you into their home. Their big, enormous home, with 50 states and 300 million people. Thank you, Allison and Estelle. I’ve been meaning to start a new competition one of these days – to celebrate the new year by getting you guys to write a story. Or at least, the start of a story. It’s still a plan, but in the meantime, here are two (count ’em – two!) writing competitions by COOL PEOPLE, with COOL PRIZES that are really worth entering. The first is by Liz Kessler, who’s an author I really like. I managed to get an advance copy of A Year Without Autumn, her last book, and I loved it. It has a very clever time travel element to it, some lovely characters and an aspect of the plot which will probably save lots of lives of readers and their friends and family. Literally. Really. It’s a life-saving book. And her new novel, North of Nowhere, is out next week. The competition is run by the Guardian and you can find it here. You have to be 8-13, and you can win a digital camera and £100 worth of books for your school. I like this comp for so many reasons. First of all, I was in Hay about three years ago when a flash Rolls Royce drove by and I was assured that Chris Evans, the Radio 2 DJ, was inside. He was visiting Hay for the first time and nobody knew what he would think of it. I also like it because it’s 500 words, and that’s a fabulous number of words for a story. Difficult to squeeze it all in there, but wonderful if you can. Try it. You’ll see. And finally, I like it because it’s for young writers, like Liz’s. As before, you have to be 13 or under (although there’s no lower age limit for this one). So go on. Have a go. And if you’re too old for these ones, see what other competitions are out there. You never know what might happen. After all, I entered a writing competition, and look where it got me. 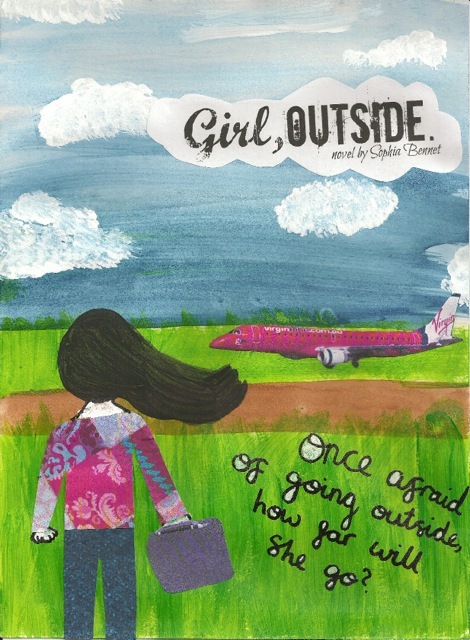 In July, the competition was to design a book cover. And as always, you made it really tough for me. There were so many great entries. The prizes were a signed copy of The Look, and a copy of Adorkable, by Sarra Manning, who’s talking with me at the Edinburgh Festival next Sunday. It took me ages to decide, but in the end, the winner of The Look was Amber, from The Mile Long Bookshelf. I love the colours in this picture, and the suggestion of adventure, and the truly great strapline. Straplines are really hard to do (as I know from bitter experience), so I was very impressed with this one. Congratulations, Amber! The winner of Adorkable was Hannah Bowstead. 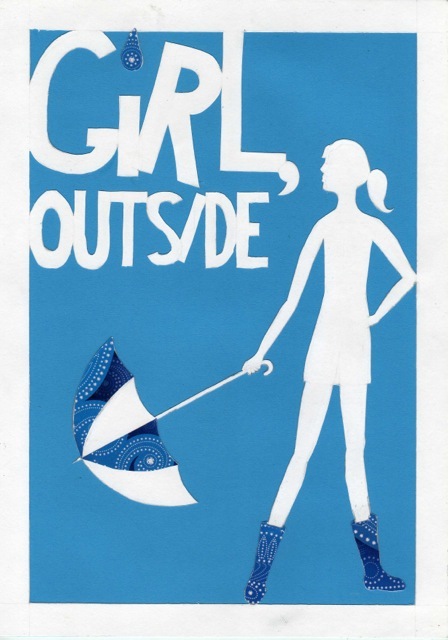 I loved the simple graphics of this cover, and the style reminded me a bit of one of my favourites – A Necklace of Raindrops, by Joan Aiken, illustrated by the amazing Jan Pienkowski. Plus, the boots. Loving the boots. Well done, Hannah. And finally, an honourable mention goes to Sara Coggin, whose blog, Box of Things, is also worth a look for its beautiful photographs. This drawing captures the spirit of my other books, I think. Loving the handbag, and the bowtie, and the fact that her head is missing. Intriguing! I’ll be sending Sara a signed postcard. Thank you to all of you who entered. It was great fun to judge, and I hope you enjoyed it too. 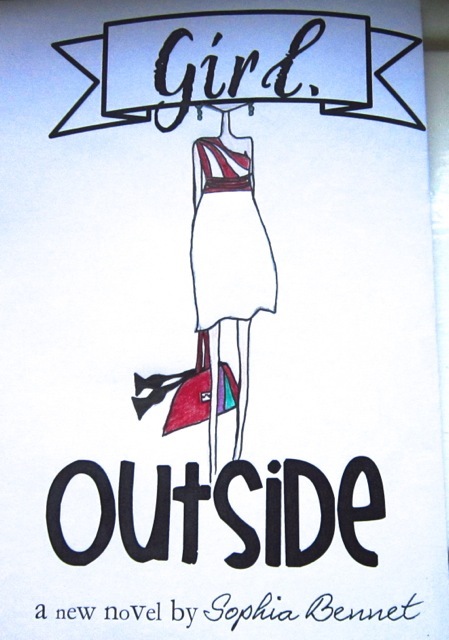 I’ll be putting these entries up on the Threadsthebook website, so look out for them there. 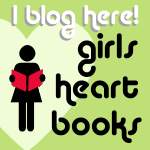 If you feel like voting for your favourite author, and making one UK lady (or gentleman, but honestly, puh-leese) you can find out what and why here. I must remember never to run a competition. They are the icebergs of authorial websites. The good bits – the bits I remember and that make me do it again, despite everything – are choosing the theme, getting the entries in, hearing from readers and new fans about what they’re up to, reading some truly great stories, admiring some great pictures (and now video too), and enjoying the countdown to the big announcement. Actually, that adds up to a lot of good bits. Maybe I will run another competition. One day. Anyway, they’re the pretty white tip of the iceberg sticking up above the water. What you don’t see – and I tend to forget – is the dirty great grey bit underneath. First of all, there’s whittling down my favourite entries (generally a dozen or so) to the few who will finally get a mention and win a prize. During this process, which lasts for days, I feel mean. Seriously. Mean. So many girls put in so much work – or just showed a natural talent, you can never always be sure – and some of them are going to be disappointed, thinking I didn’t like their entries when I did, I DID! Then there’s the admin that goes with fighting with the back end of a website, trying to put up all the winning entries, so you can admire them. It takes ages! Anyway, it’s done now, so check out the Competition page of the Threads website, follow the links, and enjoy the 5 entries that made it to the top. … Which means I’m going to have to run another competition sometime, aren’t I? I guess I suppose I am.